Mostly Spring but with some good snowfalls in a few lucky locations! - Heavy snowfall in Vermont and along the US East Coast (up to 90cm/3ft last weekend). 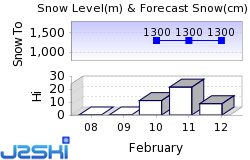 - Up to 45cm/18in snowfall in 24 hours in the Eastern Alps. - First ski areas end 18-19 seasons in Connecticut, French Pyrenees and elsewhere. - Up to 60cm of fresh snow in the past 7 days at some ski areas in Norway. It's been another mostly dry week on the ski slopes of central Europe - in the Western Alps at least. There was some fresh snowfall in Austria/Eastern Switzerland, southern Germany and the very northern fringes of Italy at the start of the week, with some areas reporting as much as 30-45cm of fresh snow on higher slopes, but for most the numbers were much less. There's been a little snow in the Pyrenees too and even down at Europe's most southerly ski area, Sierra Nevada in Spain. But mostly it has been another week of classic spring skiing with the snow freezing hard overnight then softening through the day – especially lower slopes as temperatures climb above zero. That said, it has been a little colder than the week before in many areas. In many areas this week temperatures have stayed below zero (down to -15C or even lower at times) above 2000 metres and have been dropping back below freezing overnight at resort level too. The most snow in Europe has been falling in Scandinavia, for the second week running, with some resorts in Norway posting 60cm in total over the past week, a few getting more than 20cm in 24 hours for some Spring powder days. It has been snowing too in Scotland but alas also thawing between cold spells so the overall picture, in terms of open runs and ski centres, has deteriorated from the season high last week. North America has had a snowier week with the biggest snowfalls initially on the East Coast at the weekend with some resorts getting three feet of snow in Vermont and most others in the region getting at least a foot of fresh. Since then the focus for fresh snow has moved to the west coast with more heavy snowfalls in California in recent days, as well as in other western states, building on what are already some of the deepest snow bases in the world this season. Although there are hints of a breakdown and a possible return to snow, in the long-range forecasts, it looks like more of the same (Spring skiing) for the next week or so at least. Austria saw widespread snowfall across the country to start the week with temperatures dipping back below zero. Most areas got 5-15cm of fresh snow but Saalbach, St Anton and Montafon all reported 30cm in 24 hours to Tuesday morning. Then the sun came out again for some great spring powder. A number of low altitude Austrian areas will close for the season this coming Sunday so they're going out with a bit of fresh snow at least. The glacier areas which stay open to May, June or even longer (all year in Hintertux's case in fact) got more of the fresh snow and with most having at least 4 metres of snow lying it looks good for the late spring skiing season ahead. It has been a second dry week on French ski slopes with some glorious sunny weather on the slopes and – as with most of the northern hemisphere – spring-skiing freeze-thaw conditions and the best snow on higher runs. The country's purpose-built ski areas have a bit of an advantage at this time of year with the snow still lying at least a metre deep at resort level for many and staying in good shape top-to-bottom all day. Some of the classic, lower areas with slopes 500-800 metres lower down the mountain are having more of a battle maintaining cover. There's been a bit of a thaw from a week ago but most resorts still have plenty of snow left with the Paradiski region posting marginally the deepest upper slope depth at 3.3 metres (11 feet) but really most of the country's leading areas reporting good depths, generally above 2 metres on upper runs. In the Pyrenees, where some resorts have struggled for consistent snow cover this winter, Formigueres closed on Sunday, a week early, saying it had lost its battle to maintain enough snow that was worth skiing on, ahead of the originally planned closure date this coming Sunday. A similar picture again in Italy with just some light snow falling at times on higher slopes along the country's northern border with Switzerland and Austria. Otherwise it's a mostly sunny picture with the season winding down at the country's lower elevation ski areas, some of which will be closed from this Sunday. On the other hand, a dozen or so Italian areas plan to stay open into May, and some beyond, with Passo Stelvio (which opens from May to October) looking good for the start of its summer season at least. Most Italian areas do have plenty of snow to see them through to their season end anyway, whenever it may be, only a few like Alpe di Siusi with just a few centimetres on its lower slopes and less than 40cm up top look like they're struggling if their published stats are correct – but equally they still report every run open! Swiss slopes are in a similar position to the rest of the Alps – spring conditions, colder this week than last, particularly up high, and some light to moderate snowfall at the start of this week (with more forecast at the weekend. Davos Klosters reported a 5cm accumulation on its upper slopes on Sunday and then on Monday there were more significant falls, with Laax posting the biggest accumulation in Europe for the past few weeks – 45cm in 24 hours. No other area posted anything like as much as that though. Swiss ski areas continue to post the world's deepest bases at Andermatt (6m/20 feet) and Engelberg (6.2m/nearly 21 feet) and most of the country's big resorts are posting healthy snow depths on their upper slopes. Cover down at resort level is getting more marginal though and is at completely the opposite extreme. Engelberg has only 10cm for example, and Zermatt, with more than 2 metres of snow on its year-round glacier slopes, has only 26cm lying on its home runs down into the village. Until the snowfalls in the Alps at the start of this week, by far the most snow in Europe over the last week (and indeed the one before that) had been falling in Norway and Sweden. That continues to be the case to some extent with heavy snow expected up in Riksgransen up in the Swedish Arctic later this week, with up to 50cm forecast there by Friday. Scandinavian ski areas as a whole come into their own at this time of year, particularly to the north, with the longer, warmer days at these northerly latitudes but temperatures still generally cool in the days without the rapid afternoon softening of the slopes common in the Alps. There was a little fresh snow in the Pyrenees at the weekend and even as far south as Sierra Nevada down on the Mediterranean coast but overall the trend for full-on spring is the dominant one and at least one ski area in the French Pyrenees, Formigueres, decided to give up the battle against mother nature last Sunday, closing a week earlier than planned. 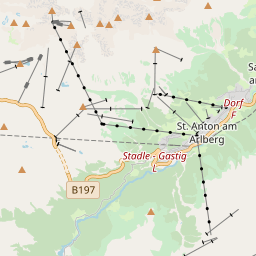 Depths remain good in Andorra however where almost all trails remain open with top to bottom skiing still possible and up to 2 metres lying on upper slopes. Another roller-coaster weather week for Scotland's long-suffering ski areas this season. Having re-built bases lost in the record-warmth February thaw over the first three weeks of March, a week ago all five Scottish Highland ski areas were open with a season-best 70 runs open between them. By the weekend though a fresh spell of warm weather wiped out a lot of the cover with the result that Cairngorm and Glenshee now have no skiing open and The Lecht just has the all-weather machine-made snow. There was fresh snow in the west on Sunday with more flurries since and Glencoe has been almost fully open this week and Nevis range has a good selection of runs too. Temperatures have dipped a little over the past week in Eastern Europe with some fresh snow in the Tatra mountains of the Czech and Slovak Republics. Bulgaria too is having a snowy week and in fact, looks like this will be the snowiest week for a month or two there if the snow keeps falling as forecast. Totals look like they may be as much as 50cm of fresh snow by the weekend across the country's higher ski slopes if so. Changeable conditions in Canada with some good snowfalls in the Quebec region around the weekend bringing up to 40cm more snowfall to resorts in the East. Tremblant has the country's deepest base still at 5.7 metres. Further west it has been quite snowy in recent days in BC and western Alberta with 10-30cm of fresh snow falling and there's a similar amount in the forecast up to the weekend. Whistler is forecast to get 30cm of snowfall by Saturday. A return to snowy weather in the US over the past week, initially with heavy snow on the East Coast at the weekend – which saw some ski areas in Vermont report as much as 90cm (three feet) of new snow in 72 hours, and heavy snow almost everywhere in the region, then more recently a return to snowy conditions in California after temperatures had a dew fairly dry weeks. It's still snowing here but it's likely some centres will see another 60cm (two feet) of snow by the weekend. Until next week, enjoy the Spring! Ski Hire Shops in St. Anton am Arlberg, Saalbach Hinterglemm and St Gallenkirch.